This page is an attempt to use and provide tips on the various features provided by Google Pages for creating web pages. 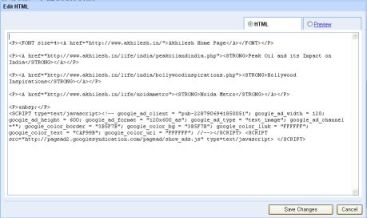 This page features tip on integrating AdSense to the pages created using Google Page creator. Ofcourse you will need an AdSense account to do so. Creating an account is very simple. Just click the above button to get started. Once you are in the Edit page mode of the Google Page Creator, click on the location where you want the ad to appear. 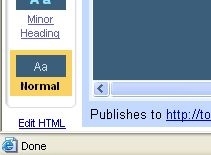 Then click the blue Edit Html link on the botton left of the page, as shown in the figure below. This will launch you in a html code editor. And as shown below insert the AdSense code in it at the appropriate location. Click Save Changes and you are done! Now you will get the ads as is present on this page.